A mezzotint after a painting of an interior in which three three-quarter length figures are gathered before an easel: George Smith stands on the left, holding a palette. His brother William is seated in the centre, and John leans upon the back of his chair. 1st state. Inscribed below, in scratched letters: W.m Pether, pinxt, fecit, & exc.t / George, William & John Smith, Painters at Chichester. This is a typical eighteenth-century ‘conversation piece’, depicting acquaintances – in this case, brothers – gathered in an interior for informal social discourse. William, George and John Smith all worked as artists and derived a little celebrity from that fact (though extended families of artists, often over several generations, were commonplace throughout Europe). William (1706/7–64), here seated and holding a walking stick, practised as a painter of portraits and still lifes in London and Gloucester. 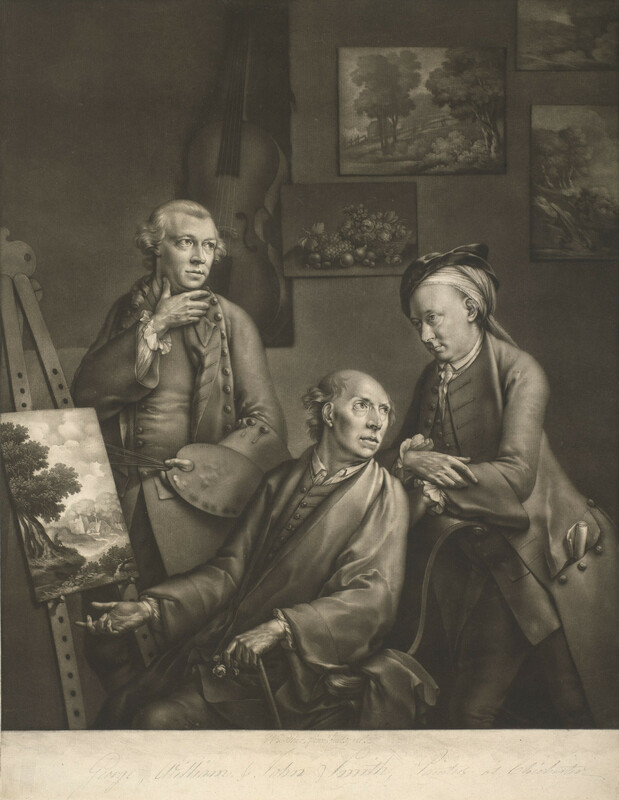 George (1713/14–76), the most talented of the brothers – he was also skilled at the violoncello (seen here in the background) and published his own poetry – worked with William for some years but then went his own way and made his reputation later in life as a painter and printmaker of landscapes. John (1716/17–64), the youngest, worked alongside George for much of his career as his assistant and collaborator. William Pether was a pupil of Thomas Frye (RCIN 654855), completing Frye’s unfinished mezzotints on his death and then working on his own account as a printmaker, painter and draughtsman. The inscription states that the mezzotint is after a painting also by Pether, now unknown.